1 x 40 or 2 x 20 minute sets over a maximum 3 hour period. Electric Violin Duo comprises two of the UK's top violinists, bringing together a breadth of experience and talent that delivers a stunning high energy performance fit for any occasion. ‘Two of the most talented girls in show business… a dazzling show’. This comment neatly sums up this fantastic double violin show, which promises a dynamic and wide-ranging programme that appeals to all. The duo can perform to high quality backing tracks or with a live band. The show is perfect for large-scale corporate events but is also suitable for smaller occasions such as private parties and weddings. The show includes wide range of music from classical repertoire such as Vivaldi through to iconic stage music and film themes such as tunes from Bond Movies, Chicago and West Side Story to name a few! 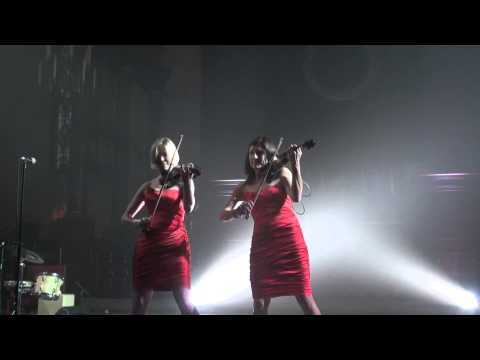 With such wide-reaching range of music to choose from, Electric Violin Duo offer the flexibility to provide exactly the right music and ambiance for your event. The incredible musical abilities of these violinists have taken them around the world to Europe, Canada, South Africa and Australia where they have performed at festivals, corporate events and as headline artists on luxury cruise ships such as Seabourn and Cunard. Both violinists are in high demand as session musicians and have appeared live and on TV with artists such as Moloko, Leona Lewis, Moloko, Shirley Bassey and Michael Buble! Both musicians trained at two of Britain’s most revered conservatoires, the Royal Northern College of Music and the Royal Scottish Academy of Music and Drama. After graduating, both pursued fruitful professional careers as freelance artists working with major orchestras including The London Concert Orchestra, RTE National Symphony Orchestra and many more. Standard Set Times: 1 x 40 or 2 x 20 minute sets over a maximum 3 hour period. Technical Requirement: Sound equipment is normally provided by the client. A small PA for up to 80 people can be provided, see Additional Options.